Dr. Zhou’s research interests focus on design and synthesis of new electronic materials including superconductors, spintronic/orbitronic materials, thermoelectric materials, multiferroic materials and magnetoresistive materials. He has emphasized relationship between crystal structure and physical properties of transition-metal oxides. 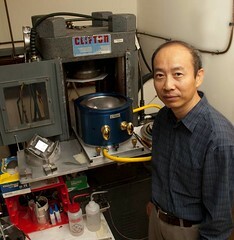 Over the past twenty years, Dr. Zhou has established several important facilities in the Texas Materials Institute for the materials synthesis and characterization which include single-crystal growth with the floating zone method, high-precision crystal orientation, and high-pressure synthesis. He has also developed many setups to measure transport and magnetic properties and to determine the crystal structure under pressure. High pressure becomes an important tuning parameter in his materials research.